Magic: The Gathering is a ridiculously fun game to play. There’s a reason why it’s endured so many years and set after set, each with new game mechanics. We’ve bought tons of cards, many every deck combination possible, and yet we keep coming back for more. Star Wars, on the other hand, is a ridiculously fun franchise to watch. Even the worst of the films contribute something to the mythology, which has continuously stayed in the public consciousness. Combine the two, and you have a force more powerful than you can possible imagine. Pun intended. 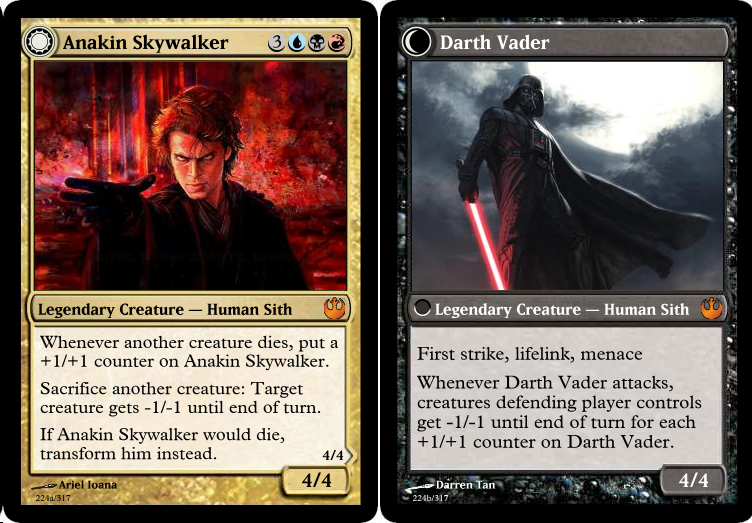 So… there’s a Star Wars version of Magic: The Gathering? Yes, though it’s not official. It’s called Star Wars: The Gathering, and it’s been posted on imgur by the user WhinyTortoise. It’s only a first draft, apparently, but it features a shocking amount of painstaking detail. Well, first of all the artwork is fantastic. Taken from various sources ranging from deviant art to table top campaign guides, the art chosen is always reminiscent of the style of the actual Magic: The Gathering, which helps sell it as an extension of the base game. And the best part? In lore it all kinda makes sense. What about the hero cards? What time periods does it cover? We sincerely hope this gets the attention of the right people and becomes a real spin off set. Though, at the very least we can always print these babies out and glue them on cardboard. Either way, it’s a fantastic job and we hope to see more sets in the future.